Summertime, especially here in the southern United States, is in full swing and doing its best to make sure everyone knows it. When temperatures are consistently over 90 degrees with humidity in the 70s or 80s it makes going outside a very arduous chore. But when you have a puppy, it is a necessity to get them out and exercised. So I want to share some tips with you on how to get your puppy the exercise he needs when it is too hot to go outside! First and foremost, I want to say that there are times when you are just going to have to go outside, most notably for bathroom times for your puppy. So when you have to go outside for any time make sure you go prepared. Choose the coolest parts of the day to take your puppy outside. When you need to take your puppy for bathroom time, early mornings and late afternoon and evenings are best for being able to spend more time out and about. Choosing these times will give your puppy the ability to stretch his legs a little more and you won’t have to worry about the sweltering heat quite as much. Of course, it can still be hot so being prepared is still key! Before going outside, make sure to offer your puppy water. As the saying goes, you can lead a horse to water, but you can’t make him drink. And that is a pretty apt saying for this situation. If your puppy doesn’t drink, then so be it. But always make sure to offer. Now, I put “command” in quotes on this one because it is not a compulsory command, and not one that you can enforce. What you are doing is offering a suggestion to the dog, and reminding them of what you would like to happen. Similar to Pavlov's dogs you want you command to drink to bring up in your puppy a desire to drink. And teaching this is easy, it just takes a little consistency and you just taking the time. Basically, each time your puppy approaches the water bowl to drink (and the key is while they are approaching and in the process of feeling the urge to drink), you give them the “command" you want to use. Something simple like “drink water” or “water bowl”, or really anything you wouldn’t mind standing in a rest area in the middle of Kansas and saying to your puppy, will work. Your goal here is to say it gently enough that they hear it, but doesn’t distract them from the task at hand. The same goes for the praise. After they have taken a couple of mouthfuls of water, tell them "Good Puppy," and let them finish. You can then extend this to new areas, and new types of water bowls. 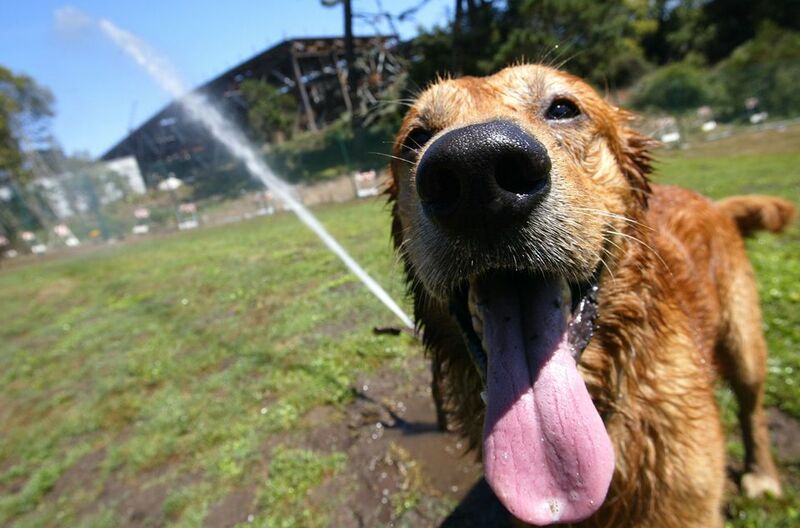 When on an outing, it is a great time to reinforce the command because drinking the water is its own reward! Put down the water bowl, fill it up and say “drink water” (or whatever command you chose), let them get some water, and praise gently. If they don’t drink, offer it again - equally as nicely, no correction, no "wrong", no harsh tone. Then just let them find it on their own, and keep reinforcing it at home. If you are going to be outside for more than a few minutes on a bathroom walk, pack water. If you are like me and Zoey, and sometimes you get distracted by the world around you, it is good to come prepared. I always try my best to grab even a small bottle of water when I go outside for a bathroom walk, so that if Zoey sees a leaf she wants to play with or I see a Pokemon that's calling my name, I am ready to go! Bare minimum, I can make a bowl with one of my hands for Zoey to drink from! If the sun is harsh that day, or you are going out in the strongest parts of the day consider taking an umbrella. I know it sounds a little Downton Abbey to carry a parasol for the sun, but you aren’t wearing a fur coat. And the sun can actually be even worse if you have a hairless or extremely short hair dog! Carrying an umbrella to offer a bit of shade can really help to keep your puppy cool in the midday sun. If you have a hairless dog, one with extremely short hair, or any shaved spots you can apply sunscreen to help. I know it sounds weird, but there are hairless dogs that will burn just as bad as any human if they don’t have sun protection. We use to have a Chinese Crested that came in for daycare, and every day we would have to apply sunscreen to him. It was always a funny process, but necessary! So be aware of light colored and hairless places on your dog so they don’t get sunburned. Just be careful not to get sunscreen in their eyes. Keep in mind that asphalt is HOT in the summer. During summer it always kills me to see someone walking their dog across the blacktop of a parking lot with no consideration for the heat. Yes, dogs paw pads are stronger than the bottoms of our feet, BUT they can still easily blister and burn (especially if they are an inside dog that spends most of their time on carpet and rugs.) So if you wouldn’t want to walk across it, don’t make your puppy do it. When you need to take your puppy for bathroom time, early mornings and late afternoon and evenings are best for being able to spend more time out and about. I have talked about this topic a little before in article about good games to play with your puppy, but I will talk about it some more here and offer you some good games to play to help get their energy out while still enjoying the miracle of AC. Recall games with a puppy are one of my all time favorite activities! Seriously, you get to work on so many things and they just look so darn cute and happy while bounding from person to person. The simplest recall game to play is just a simple back and forth across a living room, hallway or kitchen. Each person should have a handful of treats, one person gently restrains the puppy by the collar, and then the other person starts to call them. Don’t immediately let go, wait a half second to get the puppy a little more excited about going then direct the puppy towards the other person! Once the puppy gets there, give him a treat, praise him, and prepare to send him back. Keep doing this for a few minutes at a time. Really up the ante on this game by using stairs, going around corners, and covering longer distances. If your puppy becomes disinterested in the game, go ahead and wrap up. This is supposed to be fun for everyone involved, and NEVER correct them when they come even if they get distracted part way. This is a recall game variation, but it is too much not to give it its own space. The great thing about this one is that you can play it with only one person. Simply wait until your puppy is distracted and sneak away (make sure you have a snack in your pocket). Make it easy the first few times until your puppy gets the idea. Hide just one room over and call your puppy. Stand behind a door. Hide behind the curtains or behind a couch or chair. Just be aware, if you hide in something like a cabinet or closet that your puppy may learn how to open these things! So be conscious of what unintentional training you may be doing while playing this game. If you have more than one person, each person should hide and take turns calling the puppy once he has found one of you. If he is really good at this game, both people call him and see who he finds first! Rewards and lots of praise make this a fun game to keep attention. Take them somewhere like a pet store. Granted, this one requires going outside some to get there, but once you are in the store think about all the great things you can do! You can work on all that training I know you are diligently practicing every day. Doing "sit-stays" in front of the bone displays. Working on sitting and greeting people nicely when the store staff offers him a treat. Practicing "come when called" when he is distracted by that crafty low bucket of treats stores always have. Using "leave it" when they think that the ferret cage is the greatest invention they have ever seen. Just be aware of the points I made earlier, especially the heat of the parking lot when walking in. Have lots of fun and interactive toys for your puppy. In my article about chewing, I outlined a series of great toys to have to make an enriching environment for your puppy. This will be a key point to consider on days when playing outside is not very easy due to the heat. Make sure to check out that article for a complete list. Keeping a puppy happy and exercised during the peak of summer can be challenging. But with a little time and creativity you and your puppy will be worn out and satisfied in no time if you follow these easy tips!